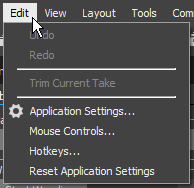 Hide all panes Closes all the panes in the layout, leaving only the main viewport. Info pane Opens the Info pane for monitoring real-time tracking data of a selected rigid body in Motive. Builder pane Opens the Builder pane for defining or modifying rigid body or skeleton assets in Motive. Open: Prompts user to select a file to open. Applicable files include Take files (.tak), Camera Calibration files (.cal), Motive user profile (.motive), Rigid Body definitions (.tra deprecated), Skeleton defintions (.skl deprecated). Add Session Folder: Adds a session folder to the Data pane in Motive. This will list all of the available TAK files within the session folder. Import Shot List: Import a list of Take names to record from a CSV file that contains Take names on each row This allows users to plan which motions to capture ahead of the time. See: Data Recording page. 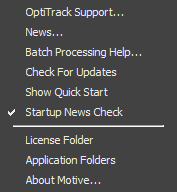 Profile (MOTIVE) files: MOTIVE profile stores software configurations. Software setting such as applications settings, streaming setting, trackable assets, synchronization configurations, and/or device configurations can be saved into this file. This file can be exported and imported to configurations in Motive. Update Default Profile: Manually update the current software configurations onto the default system profile. Which loads up at first when launching Motive and located under C:\ProgramData\OptiTrack\MotiveProfile.motive. Export Profile As...: Exports the current software configurations into an application profile (MOTIVE). Export Assets...: Export just the assets (rigid bodies, skeletons, markersets) to a MOTIVE file. Export Tracking Data: Exports tracking data from a selected Take into the desired output format. See: Data Export. 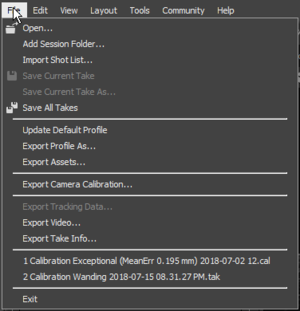 Export Take Info: Exports basic information of each TAK in the currently loaded session folder. Camera Calibration pane: Opens the Calibration pane for calibrating the camera system. Info Pane: Opens the Info pane for monitoring real-time tracking data of a rigid body. Builder Pane: Opens the Builder pane for creating trackable models or assets. Specifically, this pane is used for creating rigid body models and skeleton models in Motive. Status Log pane: Opens the Status Log. 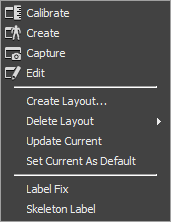 Note: Layout configurations from Motive versions prior to 2.0 cannot be loaded. Please re-create and update the layouts for use. Documentation Wiki: Opens online Motive documentation in a default web browser. This page was last modified on 26 July 2018, at 06:45.